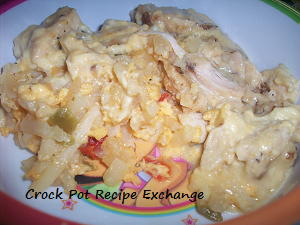 This crock pot cheesy chicken and hashbrown casserole made throwing supper together in the morning a breeze. I admit, I cheated (and will continue to while we’re building our house…. and with our super busy schedule in general) by using frozen products instead of fresh, but who can blame me for that right now with ALL of the stuff going on with us right now? I do plan on having a small-ish garden this year so I’ll redeem myself during the harvest. Right? RIGHT! 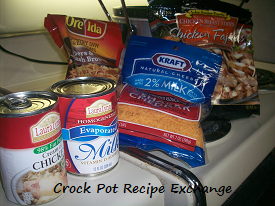 Spray the bottom and sides of a 4 – 6 quart crock pot with non-stick spray. 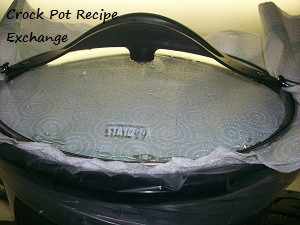 I opted to use a slow cooker liner because it makes for easier clean up. 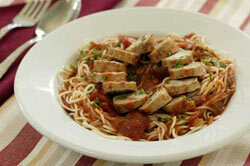 Pour the bag of hashbrowns in the bottom of the pot and spread out in an even layer. Do the same thing with the chicken and cheese. In a medium sized mixing bowl mix together the soup, milk, salt and pepper. 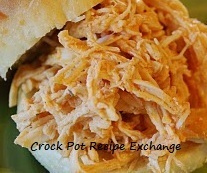 Make sure it’s well incorporated and pour evenly over the contents in the crock pot. 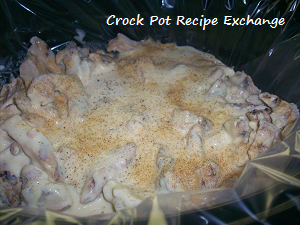 Place a couple of layers of paper towels over the top of the crock pot, securing them with the lid ( I did this because the chicken was still frozen and I knew it would produce more moisture than if I’d thawed it). 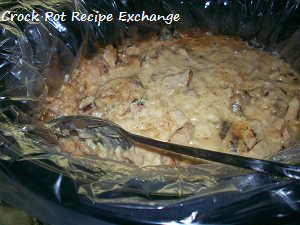 Cook on low for 6 – 8 hours on low or on high for 3 – 4 hours.